Edward Copeland's Tangents: How do you classify a film like Bashir? How do you classify a film like Bashir? 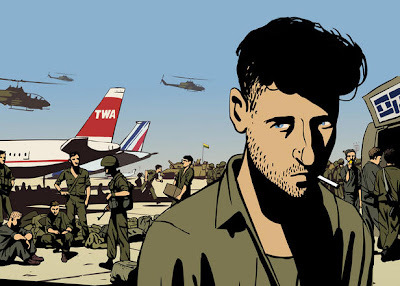 When Waltz With Bashir began making news last awards' season, it seemed to defy categorization. It was a documentary, however it was animated. However, some of the characters were fictionalized because the real interview subjects didn't want their identities revealed. On top of all of that, it also was in a foreign language (unless your native language is Hebrew). I think there is a simple classification for this movie: It's a damn good film. Waltz With Bashir uses arresting animation and riveting editing to follow Israeli writer-director Ari Folman's attempt to recapture repressed memories of his own participation in the 1982 Lebanon War, specifically the massacre of Palestinians being held in a camp. The film doesn't spend a lot of time on the politics of the war or the region, taking a more universal approach to post-traumatic stress that could happen to troops in any conflict, any time, anywhere. Despite its grim subject, it does find room for healthy doses of humor. Waltz With Bashir really is unlike anything I've seen before and it carries you from beginning to end, to its one instance of devastating real images. I agree 100%. This animated documentary is far better that a high percentage of feature films with far more greater budgets. The recreated reality builds up to the short (but truly hair-raising) bit of real images. Makes you think "never, ever again!"